E Session Closing Day and the End to a Great Summer of 2018! Thank you for a great ending to our E Session today. We’ve had a wonderful time with our 8-day session. Wherever you roam we hope that GV is sending some sunshine home with you. Soon you will receive a link to an evaluation that we are hoping you will participate in. We appreciate you taking the time to help us keep Gwynn Valley an outstanding program. 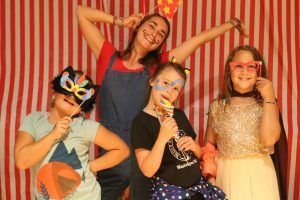 For those of you that have arrived home, we hope that your child’s experience has captured all the magic of what camp can be. We know you will hear stories and songs as the weeks go by and that the camp experience will become a great memory. Placed in the hands of a mature staff member, a camper really gains a good bit from “playing outside which produces growing inside”. From all of us, thanks again for sharing your children with us here at camp. Hope to see you next year! Click on the link below to see the E Session Recap Video. 0 0 Grant Bullard Grant Bullard2018-08-12 17:46:062018-08-16 16:33:47E Session Closing Day and the End to a Great Summer of 2018! What a Great Day at GV with Sunshine, Some Rain and Ending With Sun and Stars! Another day has ended here at GV and we’re about to end our E Session and summer with your arrival tomorrow. Our campers rose to a foggy sky but it didn’t take long to see the sun peeking through and burning away our river bottom haze. We held our last day of Discovery this morning to warm sun and blue skies which is always a plus in our Pisgah Rain Forest. 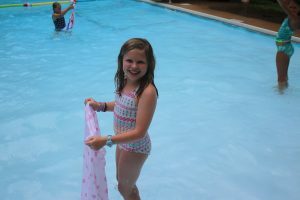 I thought it might not rain today, but it did during our afternoon packing time and while campers were at the pool. It didn’t last long but it sure rained hard for about 30 minutes. There was no thunder and lightning to send us scurrying from the rain clouds that did contain a silver lining. With the waterfront open many campers took to SUP boards, kayaks and several finished off their Jr. Lifeguard certs. 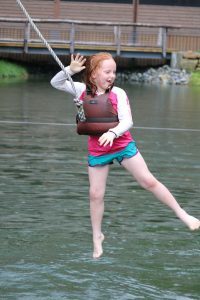 In other parts of the camp, children were ascending trees, finishing off art projects, mountain biking on the Mountainside Trail, building fires, making more ice cream at the Mill, getting ready for tonight’s play and a host of other activities. We run a half day of the program because everyone packs in the PM after lunch, singing and lost and found is handed out in the Lodge. It’s also a time when the whole camp goes to the pool or lake for a final swim. Despite the rain this afternoon everyone went and it was a great water day falling from the sky and all around us. 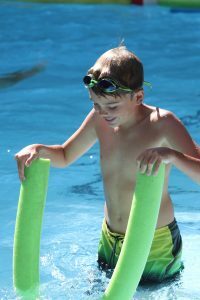 Campers come to the pool with their pillowcases and learn to wet them and then capture air inside and twist the end to form a floating pillow. It’s a great trick and it really works. About 5:00 this afternoon the skies cleared and the sun came back out to bring some bright closure to our day. After supper activities went as planned with a little extra mud here and there in places. 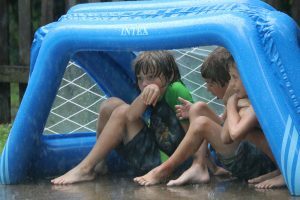 The Thunderball court was in standing water but it didn’t deter play and everyone loved it. Many dedicated campers went to look for the Tajar but didn’t find him. My guess is he had too much fun at his own Ball last night and slept through the day. He is rather old you know but has the energy of whirlwind when he’s awake. He loves to sleep and once he dozes off he’s hard to wake up (even with all the commotion of camp). At campfire tonight we honored the many campers who have attended camp for years. As a tradition at our final campfire, we honor those who are coming for their 4th and 5th year with a blanket for the 4th year and a wooden plaque for their 5th year. We also honor those staff, SIT’s and campers who’ve gone beyond the 5-year mark. Milestones are now 8 years with a compass and 10 years is a sturdy stool that has our logo and name on it. It’s made by our own Team Maintenance crew and wood from camp. It’s always special to have these campers stand and be recognized. Our fine arts group put on a play tonight called “The Stars in the Sky” and they are truly shining this evening. The children wrote the play and incorporated several aspects from our E Session. I imagine they will sing a song tomorrow at our campfire and hope you’ll stay to hear it. Tomorrow when you arrive your children will be waiting for you in their cabins. At 10:30 there will be a cabin friendship circle where all can join in. We do these each night and check in with campers to find out how their day has been. It allows staff to see how the children are doing since they only see them at morning wake-up, rest hour, before and after meals and bedtime. Our days are full and it’s a good way to learn about the children’s experiences. Mountainside and Riverside parents will gather earlier at 10:30 as well. After the friendship circle, there is our program in the Lodge at 11:00 for parents, friends, and campers. You can stay and enjoy a wonderful GV lunch at noon if you like. 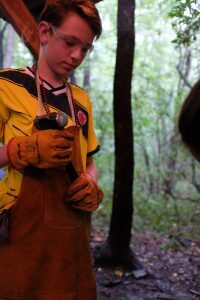 Camp is a place where children can find their direction by learning about new skills that they uncover. Camp is a place that puts them in direct touch with the outdoors and makes them feel more comfortable in those surroundings. The warmth of the community wraps around you like a blanket and reminds you of all the memories that are created here. We call that “camp DNA”. 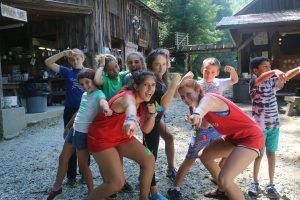 Growing up has never been harder and camp is a great place to learn about oneself and those around you as you grow. Relationship building is the keystone here and so important throughout life. Learning to live with those who are different and learning to accept one another for who we all are. It’s a place of challenge and “successful failure” where you pick yourself up and try again. It’s a place where “I can” replaces “I can’t”. While E Session is only 8 days, I hope you’ll see some positive outcomes from your camper’s GV experience. Drive carefully and see you tomorrow! https://gwynnvalley.com/wp-content/uploads/2018/08/FUJI9348-min.jpg 4000 6000 Grant Bullard Grant Bullard2018-08-12 02:47:382018-08-16 16:39:08What a Great Day at GV with Sunshine, Some Rain and Ending With Sun and Stars! Tajar Ball and More at GV! We awoke this morning to the Tajar’s folly with all kinds of pranks in downtown GV. There were so many things moved and out of place we hardly knew what day it was and where we were. Tables from the dining room were on the basketball court. Tubes from the lake were all over the Green. Folks had different name tags on and didn’t even know it. People were walking backward thinking they were walking forwards. Cups were hanging from trees and of course, the word Tajar was spelled out on the Green with kayak paddles. Despite all his folly we made it through another wonderful day at camp intact and just ended on a great Tajar Ball note. More on that later. I spent some time this morning with climbers who were on their last day of Main Camp Climbing and taking on our two Arborist trees. Arborist climbing is very different than tree or tower climbing here at camp and originally was used to access trees without spiking the trunk or limbs. It’s an environmentally friendly way to get up into trees. Through a series of knots and hitches you literally climb the rope, you’re hanging on and inch your way up like a silkworm. It’s a strenuous workout for legs and arms but you’re able to hang freely while climbing and 98% of the time making no contact with the tree. I shot some good video this morning with a drone of the two groups that were climbing and am looking forward to using that later in some camp highlight reels. I followed the bikers on their Discovery this morning on a trail ride throughout camp. We have differing trails that wind through, over and up some of the single track here on the property. This was the A groups last day of Discovery and they were going for it. The Mill made ice cream this morning and of course, everyone was happy about that. What child doesn’t want ice cream about 11 AM?! There were several cabins getting the last tie-dye session in today. Dye was mostly on the shirts and it’s a good thing we wear aprons and gloves or you might have greeted a tie-dye hand or two on closing day. Several special events took place today and one was the release of the baby calves. All summer long they have been cared for and bottle fed twice each day by our campers. Today was the day they were set free to go into the big field. It was in essence graduation day at the farm. 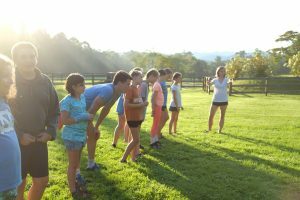 A slew of campers and staff took their lead lines and walked them to the entrance of the field. Some bounded away kicking their heels up and frolicking along the way while others were hesitant and weren’t quite sure what they were getting themselves into. Keep in mind these babies were born back in late April and early May. The whole affair reminded me of the opening day of camp when some campers just can’t wait to get to their cabins while others are a bit reticent with parent’s parting goodbyes. Another annual event is when the “smart fish” are left in the Mill Pond who have resisted the worm, corn, and bait and haven’t been caught. There’s only one thing left to do and that’s to drain the pond and let the campers get in there with nets to catch the remaining hold-outs. You can’t release the water all at once or the trout would escape to the lake. You open just a board width next to the drain and slowly let the water into the lake. As the level drops the fish are easier to catch… well for the first two minutes, until the campers start stirring the mud up on the bottom and you can’t see a darn thing. As the water drops lower the trout literally have no place to go except into the nets. There were some big trout remaining with some weighing in around 2 pounds. The campers squealed as trout swam at their feet between their legs and all around them. In total I think they caught just over 30 fish. 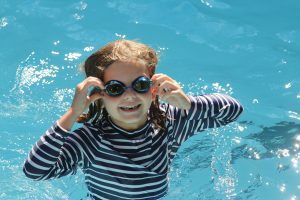 Today was a good day to try something new in the afternoon because tomorrow there will be no programs except for a camp wide swim at the pool and lake. I think at least one cabin went tubing today. Our tubing run is about 2.5 miles and we take out across the road so it’s a short walk back to camp. Campers are in tubes and we also take a raft for safety which sometimes acts as a tug boat for the little yellow tubes floating behind like ducklings. With the recent increase in rainfall it was a quick and fun ride down the flat French Broad near camp. It rained a bit late this afternoon and a visitor commented that during the pouring rain, the waterfront was alive with laughter and squeels of delight and pure funess. As the dinner bell rang tonight everyone showed up in costume to celebrate the Tajar’s birthday. There was a cookout complete with burgers, hotdogs, chips, all the trimmings, watermelon, cole slaw, and beans. That was just the beginning of a food fest. After dinner, we had a shower move in and everyone retreated to the dining room while the rain passed. Some events were moved indoors and some went on outside like the giant waterslide. 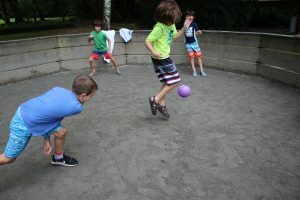 There were games of many different varieties including minute challenges, pyramid ping pong ball challenge, balloon darts, the shell game, pong bowl, soccer shootout, football toss, slackline, waterslide, hay ride, giant bubbles, swurfer swing and the sponge toss. Inside the Lodge there was face painting, tin can topple, corn hole, and guess the # of M&M’s. Some of the campers just camped out at the Waterslide which is like a big jungle slip and slide that ends in a big splash pool. As a camera man, you can’t stand too close to that pool. It was a chilly evening so we ran warm water into the slide to help with cool temps. There was also ice cream and cookies if you didn’t eat enough dinner. There will be some tired campers tomorrow because after a full day we also went hard until 8:45 this evening playing and having fun. https://gwynnvalley.com/wp-content/uploads/2018/08/IMG_8878-min.jpg 2432 3648 Grant Bullard Grant Bullard2018-08-11 02:16:172018-08-16 16:39:26Tajar Ball and More at GV! Welcome home Mountainside + Riverside! Here we are at the end of another wonderful day at Gwynn Valley! One of the biggest landmarks for today is the return of six different adventure groups who have been away from camp since Monday morning. From Mountainside, the Backpackers, Climbers, Paddlers, Bikers, and Earth Skills Crew all returned home safe and sound this afternoon. It was so joyful to see the Mountainside groups reunite as a single community. 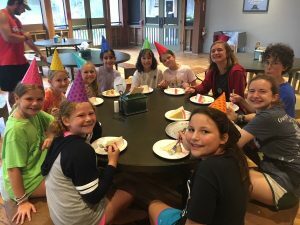 The 50 MS campers and their staff enjoyed a celebratory feast out on the Pavillion during dinner and then put on skits to share some of the highlights of their time away from camp. Friends from different adventure groups shared tales of challenges and accomplishments and just plain silly moments from their time in the field. 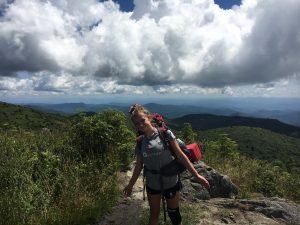 The Riverside team also returned from 4 days of hiking along the Art Loeb trail, proclaiming it the best backpacking trip yet for the 2018 summer! The older campers on MS and RS bring so much energy and enthusiasm for camp life. 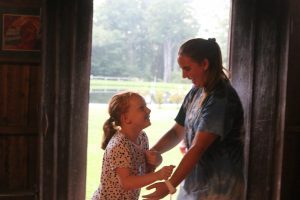 We love it when they are home and our whole camp community can feel truly together! In Main Camp, E session carried on much as it has for the last few days. 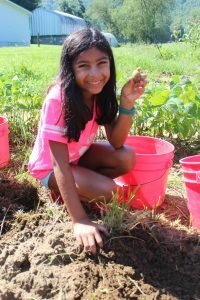 In the morning, campers participated in the 2nd day of their B day Discovery activities. 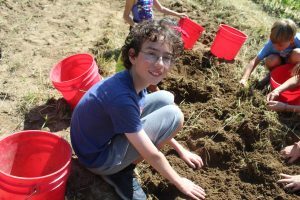 The journey of learning continues as campers build skills in their selected areas and/or work towards a final project or activity. Mountain bikers progressed beyond their drills on the Green to take on a few obstacles and basic trails around camp. Archers shot at not just at the bulls-eye on their targets but at cards and other markers that made the target more interesting. The set builders in Fine Arts are working hard to finish the physical back drop and props that will help bring the actors performance to life at Saturday night’s Fine Arts play. Progress like this was made all over camp as Discoveries marched on. The fun continued this afternoon and evening with sign up activities before dinner and Twilight Play after dinner. Sign ups happen every afternoon, but Twilight Play is special and only happens once each session. Twilight Play is like a long version of After Supper Activities. 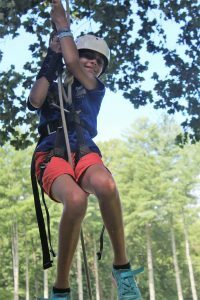 Campers choose 1 activity to participate in; for limited capacity activities (Drawn Activities), we will collect names at lunch, run a lottery during the afternoon, and later announce camper placements at dinner. 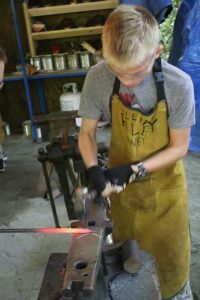 ‘Lottery activities’ included blacksmithing (pendant making), wind chimes at pottery, sunset horseback riding, sunset archery, sunset trail ride with biking, and the tower swing with climbing. 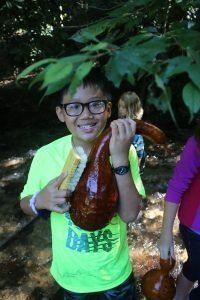 Campers could also choose to do any of the lakefront activities, campfire stories + popcorn with the Mill and Fine Arts, Kickball, Kumihimo fiesta, and fire building with a dessert option. 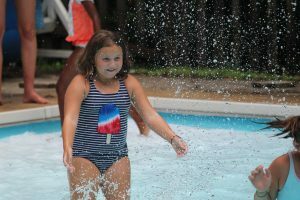 Each activity was a big hit in it’s own way and campers seemed to love the opportunity to play and really get out their energy after a delicious dinner! Everyone in camp does at least one overnight camp out each session. Tonight, Chipmunk Hut, Mountain View, Aching Legs, 7th Heaven, Meadowbrook and Blue Ridge all cooked their dinner over a fire as cabin groups and then slept in one of the many camp out shelters around camp. 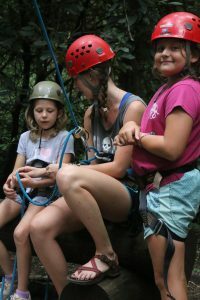 This is a great opportunity for cabin bonding as well as a chance for individual campers to get more comfortable being immersed in the natural world. 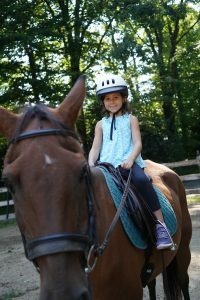 For many campers – and especially for those who were a little nervous about the camp out at the start of the session – this evening tends to be one of their favorite evening activities and a great source of pride. As I listen to the Hillside creek and chirping cicadas outside my office window, I am grateful that we are ALL immersed in the natural world here at camp. Even our staff working in the office are still within earshot for the natural symphony playing all around us. 0 0 Maggie Howe Maggie Howe2018-08-10 03:49:432018-08-16 16:39:48Welcome home Mountainside + Riverside! A Day on the River Makes for a Perfect Day! What a great day on the river with Mountainside. I left camp this morning at about 8:15 and arrived at the Tuckassegee around 10:00 to meet them. They were camped at Mills River Campground which is a National Forest campground between here and Asheville. The Tuck River put-in as we call it is in Dillsboro, NC. Of course, the best part of the day was being out with Mountainside and on the river. They did a great job and will be heading back to the Tuck tomorrow to further sharpen their skills. The group practiced a lot of peel outs, S turns, ferrying and hitting eddies. They are well prepared and should do a great job tomorrow. This group has been particularly hard working and will reap the benefits of this tomorrow. The Tuck was running high today but well within the realm of their ability. It’s a great teaching river and has many rapids and places for testing everyone’s skills that they’ve learned over the last two days on the Green River. Railroad Rapid, the first rapid, usually has some bald Eagle’s perched in the trees just above the old trestle and the group saw one today. Below that is Tuck Shot, Double Drop, Moon Shot, Surprise Eddy, and Johnny Come Lately. The campers took advantage of JUMP rock on river left about 2/3 of the way down today. It’s about a 12-15 foot rock that is easily climbed and then drops straight into the water. There’s plenty of depth and it’s fun to jump in two’s and three’s. Everyone went at least 3-4 times today. All adventures get back tomorrow including Riverside. We will be ready to welcome them back into camp and hear all the wonderful stories they’ll have about their adventures. 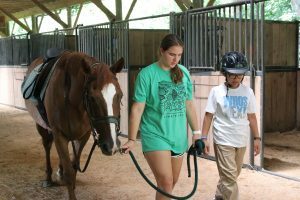 At camp, children get what they need to develop physically. They experience fresh air, exercise, a balance between routine and unstructured time, and all the good food their bodies need. 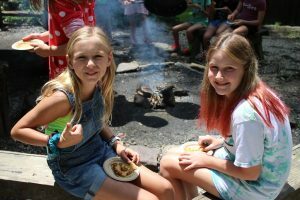 Not that s’mores don’t have a place at the campfire, but a good camp experience is also about helping children find healthy lifestyles. 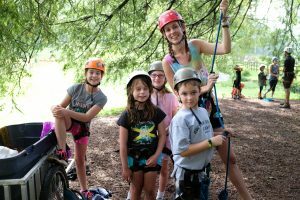 Counselors that care enough to look after a child’s physical health, bringing out the camper’s best by encouraging manageable amounts of challenge, are also conveying to the camper a belief in the child’s physical capacity to cope with the challenges before them. That’s important for children’s long-term physical development. We were certainly doing that today. Small doses of running challenging rapids and trying new moves in the boats were all a part of our day on the river. You could tell at the end of the day this group was more confident and more skilled than even the day before. Hopefully, we can share some of the videos we shot today. After dinner, was, of course, our regular after supper activities. Mountain Dancing followed in the Lodge for Brookside and Young Leaders also came along to shake a leg. It was a lively group and very enthusiastic. Debbie provided the music and Kevin and I called the dances. It’s a fun way to spend an evening and also good exercise. Your children may come home tired after our week of constant movement and stimulation. Camp is many moving parts like a machine but more gentle in so many ways. The energy levels ebb and flow and there’s always laughter, excitement, curiosity, focus, serious thought, imagination, and people conversing and discussing. Camp is really hard to describe unless you’ve experienced it. And it’s different every day. Stayed tuned as we share our full and lively days the rest of the week. https://gwynnvalley.com/wp-content/uploads/2018/08/IMG_7879-min.jpg 3456 5184 Grant Bullard Grant Bullard2018-08-09 02:06:022018-08-16 16:40:10A Day on the River Makes for a Perfect Day! Beautiful Morning As We Start Our Second Day of Discovery! We had another beautiful morning here again today and by midday, the sun was rather toasty. Today we celebrated our last international day of the summer focused on France, Russia and Israel. Our Mountainside and Riverside groups are into their second night of being out of camp. We heard from several of them and everyone is doing fine. It’s been scattered showers for several groups but not to the point of impossible by any means. I will be going out with the paddlers to the Tuck tomorrow. Paddlers usually get wet and stay wet so it doesn’t matter. When you’re surrounded by moving water all day a little rain doesn’t faze you. Even on paddling trips, we make sure campers are wearing paddling jackets and staying warm. It’s just part of taking care of oneself and others in those conditions. 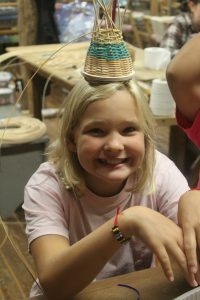 Today was the second day of Discovery or B day and campers were trying out activities for the first time this morning. I went to the climbing tower this morning to shoot some drone footage of those little spiders moving up the wall. I also visited with the mountain bikers as they made their way around camp. 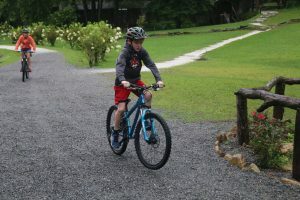 The climbers and bikers were learning knots to knobby tires. Zach had a course set up on the Green to help with shifting, braking all while pedaling. 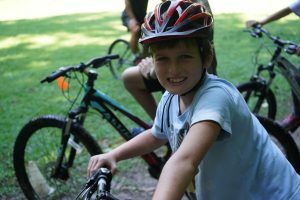 Most of our campers probably don’t spend a lot of time on a bike so riding in areas with the uneven ground can be challenging. Climbers will test themselves on our trees tomorrow and scale some of our Hemlocks just next to the lake. Going to the Mill is like stepping back in time because the Mill was built in 1890. That’s a long time ago and trying to relate what life was like then and how it’s changed from our Mill of today. It was I’m sure a community Mill where folks brought their grain to be ground, catch up with the local news and pass some time with friends. 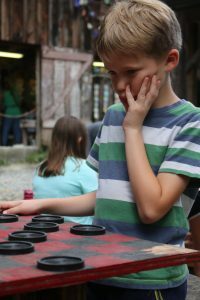 You might even engage one another in a friendly game of checkers which we still do today. While at the Mill there are many implements and artifacts from that era including corn husk dolls and toys made from corn cobs. It was a simple life. Besides learning about grinding corn from our corn crib, there was also a group outside fishing from the small pond below the waterwheel. 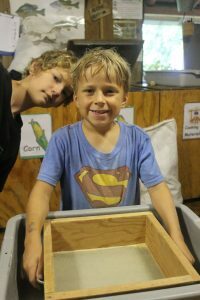 The campers inside the Mill learned about the dried corn they would be grinding, how to take it off the cob and then how to “process” it after it had been ground up. It is many stepped process that they go through to reach the final products of cornmeal, grits, and chicken feed which goes back to the farm. We consume all the cornmeal and grits here at camp. We learned about the weevils and the moths that live by eating the dried corn and how to get rid of those. Of course, the Mill puts on a different face when it offers “corn cob creations” which it will later this week. While near the Mill this morning I visited the weavers up in Shady Grove. 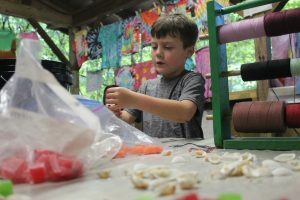 We have 11 floor looms that campers can create intricate patterns on. They use a combination of their own designs and also the levers and foot pedals of the loom to design their pieces. It’s a methodical pace that takes patience and focus and the final product is very nice. Another craft that harkens back to simpler times is taking a dried gourd that’s grown at camp and clean it up, paint it, cut it out, sew things into its thick skin and create a piece of art or perhaps a vessel to hold life’s treasures. The gourds dry out in an old barn through the winter and each has a distinct knack for patterns of mold and mildew that once scrubbed off, revealing a nice skin that is easily decorated. The first phase of cleaning the gourd is the hardest. You get it down in the creek next to the Mill and scrub with all kinds of brushes and pads to get down to the nice layer. From there it’s up to you to design it with your own purpose and ways to enhance its natural beauty. Working with your hands and learning handicrafts is very satisfying. It might come in the form of building your first fire or creating a piece of tapestry on the loom. We live in such a mechanical world and technology surrounds us. It’s nice to involve ourselves in activities that are “human-powered” with simpler approaches to an end result. Camp gets children outside for most of their day. While our buildings have walls many are open to the fresh air and sounds and sights of nature. Playing and learning outdoors increases ones appetite for curiosity. 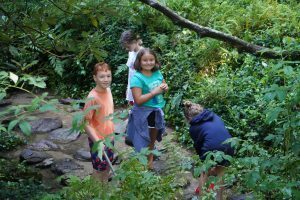 Walking upstream in a creek to discover the small animals that live there can set in motion questions and imagining that can lead to lots of personal discovery. It also helps us to not fear the unknown and creates wonder and awe and sense of place in our ecosystem. 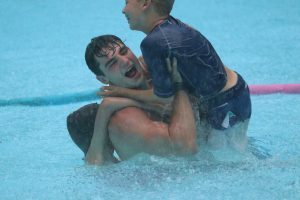 Camp helps children feel in control of their lives. Children who experience themselves as competent will be better problem solvers in new situations long after their laundry is cleaned and the smells of the campfire forgotten. The goal here is to encourage a child’s sense of self, their perception that they have some say over daily activities at a camp. They learn to fix problems when they happen. They learn to self-advocate. They learn that their world is manageable with some help. 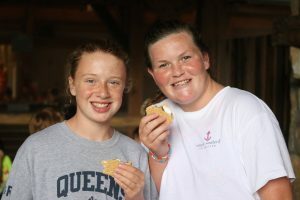 Camp is simply a great place for children to take a good bite out of growing up, but not too fast. Stay tuned! 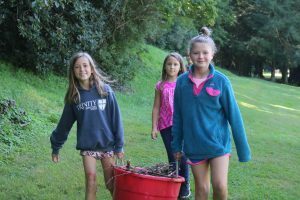 PS – Parents, there will be maintenance on the Campminder website tonight, August 7th, from 11:30 pm to 2:00 am Eastern Time. https://gwynnvalley.com/wp-content/uploads/2018/08/IMG_9666-min.jpg 5184 3456 Grant Bullard Grant Bullard2018-08-08 01:18:252018-08-16 18:16:24Beautiful Morning As We Start Our Second Day of Discovery! First Day of Discovery and Cruising at 6000′ ! What a day here at GV. The weather started out beautifully this morning as we held our first day of Discovery. Campers were discovering so many new things and enjoying time well spent with our staff while learning and stretching themselves. Miss Mary Gwynn, who founded the camp in 1935, said: “do something difficult every day!” We do stretch ourselves and it’s always fun to do with new friends to share these experiences with. 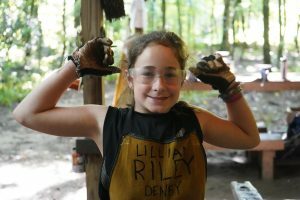 In our photos, you will notice campers climbing on our wall, turning hot metal into objects of usefulness (is that a word? 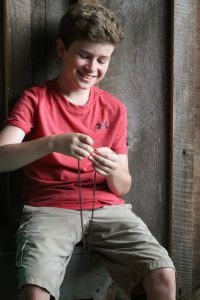 ), horseback riding, swimming, mountain biking, creating all kinds of crafts, milking and feeding cows, visiting the baby piglets, picking veggies, and tonight even doing a little mountain dancing in the Lodge. I spent most of my morning driving Mountainside Backpackers and Riverside Backpackers up to the top of the world near Black Balsam where they both began their treks in opposite directions. Riverside was heading south on the Art Loeb Trail and Mountainside was heading east on the Mountains to Sea Trail. They both climbed up toward Black Balsam where I caught up with Riverside for some GVTV video and a few stills. If you’ve never been to that part of our world, it’s a must see. It was 10 degrees cooler but since you’re over 6000 feet the sun is very intense and warm. You have to wear a lot of sunscreen as the air is a little thinner. Here at camp, we’re at 2,200 feet so that’s a 3,800-foot difference. It was a beautiful morning and a great beginning to the afternoon as I came off the mountain around one o’clock. All of Mountainside and Riverside headed out for adventures today and each covering many points of the compass. Bikers went to Dupont State Forest to ride the rock and rolling single track. Climbers headed over to Rumbling Bald for their first day and we hope they didn’t hear any rumbling from the sky. Earth Skills claimed their Wolf Den basecamp not too far from Dupont Forest. The paddlers went to the mighty Green River just near Saluda to harness their river’s energy to their benefit. Coming back to camp after lunch I walked in on a birthday celebration in progress and yes we certainly celebrate birthdays here with cake and song and good friends around the table. As the afternoon progressed we were interrupted by some thunder here and there. We have our Thorguard which alerts us to any lightening in our area and we did have a brief period today when Thor did go off. Everyone took shelter and in a little while it cleared with three loud blasts and everyone resumed normal activities. Thor measures lightening 12 miles out from camp and sends a 15-second blast that everyone hears. It was a great investment and takes the human guesswork right out of the equation. Dinner tonight was some of the best chicken I’ve had all summer and side dishes included fresh salad, beans, and carrots as well as fresh corn on the cob and freshly baked bread all from our own kitchen and our garden. Slather some butter on that bread and you’ve got yourself a tasty meal. You can’t buy food like that. Traditionally after supper games went as planned with Thunderball, Basketball, hula hoops, Tajar Spotting, Friendship Bracelets, Wiffle Ball, Soccer, and host of other games and things to do. Hillside campers who weren’t camping out tonight joined me and Debbie in the Lodge for a little Mountain Dancing. We started off with a bit of Hokey Pokey and then onto Bluebird and two Russian Folkdances called Minushka and Sasha. We finished with a dance called “Going to Kentucky”. All were lively and I’m sure helped to send those Hillsider’s off to dreamland in a hurry. It’s a cool night here and the kind where you need a little cover to take the chill out and snuggle down in your camp bed. Sweet dreams and looking forward to another active day at Gwynn Valley. Stay tuned! https://gwynnvalley.com/wp-content/uploads/2018/08/IMG_0437-min.jpg 3456 5184 Grant Bullard Grant Bullard2018-08-07 02:00:342018-08-16 18:17:17First Day of Discovery and Cruising at 6000' ! Welcome to E Session and hope your travels home or wherever your destination was safe and sound. We felt it was a smooth and easy opening and we’re just happy the weather cooperated. After your departure, everyone had a buffet lunch in the Dining Room. Lunch ended as cabins finished up and headed over to the Lodge to sign up for Discovery activities which begin in the morning. Campers sign up for 8 Discoveries of their choice and are assigned 4 for the session. Of those four, two are each day every other day in the morning slots. There are 27 different activity offerings for morning Discoveries aimed at building skills. In the afternoon a host of activities are offered to experience once or as many times as they are offered during the afternoon. So… there’s quite a variety of choices for these youngsters to choose from. After Discovery sign-ups they went back to cabins to change in activity attire. Everyone was swim assessed today and then proceeded to two of the following activities: Tie Dye, Crafts, Swimming and Lake Fun, Fine Arts, Camping Skills and Nature, Sports, Mill, Farm, Climbing, Horseback Riding, Pottery, and Archery. As you can see we jump right into the program to help with adjustment and not having too much time on one’s hands to think about home. We have a good many new campers this session and we want to keep folks busy this first afternoon. 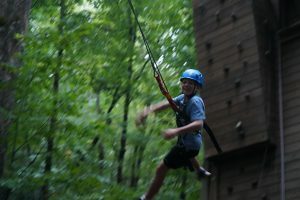 Tomorrow morning campers will jump right into their Discoveries and we’re off and running for the week. Our calendar for the week is full and we are looking forward to having some fun and great days for experiencing camp life throughout the week. Tonight at dinner we had our camper friendly pasta and marinara sauce which is a good way to start. Along with the pasta were fresh broccoli, homemade bread, and salad from the garden. Dessert as always is a giant cookie served on an XL pizza pan and chocolate chip no less. 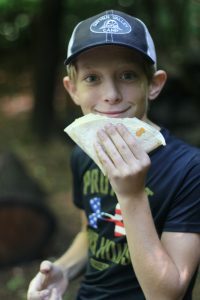 Food is important to campers and we want this day of transition to be smooth. We do our best to keep everyone in their comfort zone this first day. After dinner, we held a giant scavenger hunt for cabin groups and then everyone assembled in the Lodge to go over some nuts and bolts for the session. Campers then went back to their cabins for serenade which happens every evening. A group of our activity leaders go around each evening to let cabins know it’s lights out by singing to each cabin. This has been going on for many many years. There are many traditions here at Gwynn Valley and we hope to share even more with you as the week progresses. Stay tuned! https://gwynnvalley.com/wp-content/uploads/2018/08/IMG_0303-min.jpg 3456 5184 Grant Bullard Grant Bullard2018-08-06 02:04:312018-08-16 18:17:23E Session Opening! D Session Closing – Take Some GV Sunshine Home! Thank you for a great ending to our D Session today. We’ve had a wonderful time with our 2-week campers despite all the rain. Wherever you roam we hope that GV is sending some sunshine home with you. Soon you will receive a link to an evaluation that we are hoping you will participate in. We appreciate you taking the time to help us keep Gwynn Valley an outstanding program. 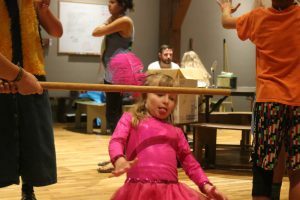 For those of you that have arrived home, we hope that your child’s experience has captured all the magic of what camp can be. 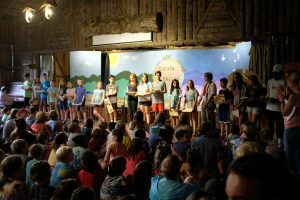 We know you will hear stories and songs as the weeks go by and that the camp experience will become a great memory. Placed in the hands of a mature staff member, a camper really gains a good bit from “playing outside which produces growing inside”. From all of us, thanks again for sharing your children with us here at camp. Hope to see you next year! Click on the link below to see the D Session Recap Video. PS For those of you who have campers in our Mountainside, Riverside, and Young Leaders Program, we will keep you posted on their experiences. Two of the groups have adventures coming up on Monday and today and tomorrow will be prepping for those 4 days out. 0 0 Grant Bullard Grant Bullard2018-08-03 16:32:042018-08-16 18:17:29D Session Closing - Take Some GV Sunshine Home! A Little Rain Can’t Dampen Our Spirits! I just returned from campfire with a slight drizzle overhead. We’ve had rain throughout the day but spirits and enthusiasm were anything but damp. Our last full day of D was truly a great one. Signups this morning were fun from all indications. Camp has to be flexible with weather and today was one of those days. We improvise and unless it’s thundering and lightening, most programs go on. There are exceptions when playing fields get too wet and creeks are too high but we find so many other things to occupy our normal routine. We did have to cancel a kayaking trip today because of high water on the river as well as a biking trip. Wet rooty trails and high water represent limits not to be pushed. Just getting a fire going is a real challenge on a day like today and it’s good for building those skills. Several different fires were built throughout camp today and each presented its own challenge depending on location and what the intention of the fire was; warmth, cooking or just getting a fire going. 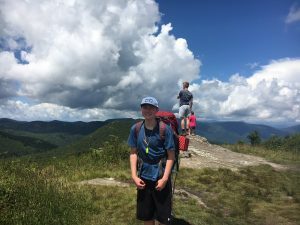 We did have some campers head out to Big Rock in Dupont State Forest for a hike this morning. They were warmly dressed in their rain jackets and the staff carried lots of food to keep them fueled up. They visited a really unique area of the forest that is covered in granite domes. This is smooth rock that is hikeable and bikeable and has a different feel that other parts of our surrounding area. It’s good to get out of camp and see the world beyond GV. New places and new experiences always offer up some interesting and fun opportunities to explore. Back at camp archery always draws a crowd and campers took advantage of our last day to sign up for archery. I watched them shooting during their morning activity. 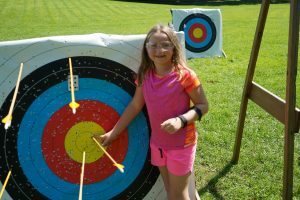 Campers love target sports where they can zero in on the bulls eye. 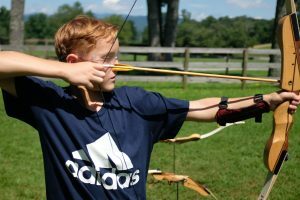 We have a variety of bows that some of our youngest campers can shoot and most are recurved bows that allow many sizes of children to use them. Most of our activities have appropriate sized equipment for as many people as possible. Our little 1 ½ Jackson kayaks are so tiny and they’re made just like an adult boat but just a lot smaller. They are perfect for our program. We also run some bikes with 24” tires for those smaller 2 wheel types. Riverside was back in camp today after completing their days on the river. It’s been chilly paddling with the rain and I think they were all ready to get back to warm showers and their beds. Mountainside will head out for their 2nd Training Day tomorrow in all directions provided the weather and elements support their journeys. The last afternoon of a session is always packing and pillowcase day and many cabins made it to the pool before the rain arrived around 4:00 today. You can do amazing things with your pillowcase after it gets wet. Fill it with air and it will keep you afloat for quite a while. It’s fun to go down the slide at the pool to see if you can fill it up before you hit the water. After all of today’s activities, folks were ready for our traditional last night of pizza, salad from the farm, fruit and our unbelievable, better than best, tasting like heaven, party on your taste buds, brownies that you could ever imagine. They’re not big but they pack so much in a square it’s like an all you can eat dessert banquet. Some choose to eat small portions a tiny morsel at a time, while others are dunkers who love the floaties in their milk at the end of the glass. And then there are the inhalers. The literally breath in the brownie and it’s gone. Campers always say they could eat the whole platter and I’ve often wondered just how many they could eat. After a belly full of pizza it would be a challenge to go two or three. As pizza was served on plates the dining room became very quiet and as the meal went on, the volume rose. When dessert arrived there was a euphoric feeling that was unmeasurable. By the time tables were cleared most of the dining room was singing songs and everyone was reliving moments from our almost two weeks together. There’s nothing like good food and good people to bring camp to another level of joy. We had it tonight. After dinner and after supper activities, we held our Friendship Campfire tonight and many children received their blankets and plaques for coming to camp for 4 or 5 years. It’s always fun to recognize these children as well as our staff, SIT’s and Young Leaders who have attended even longer. Each year we see more of our campers coming back as staff. Seeing campers come back as staff is one of the best parts of my job. The reward of having them here brings me a lot of joy. Speaking of joy, I’m sure you’ll be joyful as you arrive tomorrow to pick up your children. They will be waiting for you in the cabins. At 10:30 there will be a cabin friendship circle where all can join in. After the cabin friendship circle, we welcome you to join us in the Lodge for our end of session campfire at 11:00. After that feel free to have lunch with us and maybe walk around camp to see some of the activity areas. See you tomorrow and safe travels. PS – With our rain over the past several days, some of the roads to camp may be flooded and unpassable. Your best bet is to travel through downtown Brevard if you’re coming from the 64 west. If coming up Caesar’s Head from South 276 you’ll be fine. If coming down 280 East from I-26, avoid Wilson Rd. and come through downtown Brevard and out 276 South. Call us if you need any further directions. https://gwynnvalley.com/wp-content/uploads/2018/08/IMG_9990-min.jpg 3456 5184 Grant Bullard Grant Bullard2018-08-03 01:35:532018-08-16 18:17:35A Little Rain Can't Dampen Our Spirits!